Rookie Jacqueline Mapesa is the overall winner of the fourth edition of the Thika Greens Golf Resort Chief Executive Officer tournament last the weekend. Barely six months after receiving her official handicap, Mapesa shot a round total of 41 stableford points to triumph thanks to her double stroking. The tournament was presented by Tiles & Carpet, AAR, Samsung, Toyota Kenya, among others, and 186 golfers took part. Playing off handicap 34, Mapesa opened her winning round by sinking two vital birdie’s on the par four-first, went on to collect five pars and two double bogeys for a total of 18 stableford points from the front nine. On the tougher back nine, she maintained her steam collecting one more birdie, six pars and two bogeys, to close her round with an additional 23 stableford points. “I am shocked and elated with my win. It’s been a wonderful day all together. I was hitting the fairways like ninety-five percent,” said Mapesa. “I have been practicing a lot lately, with my main focus and target being to lower my handicap from the 30s down to a respectable 20 by end of the year,” added Jackie, a member of Kenya Railways Golf Club. 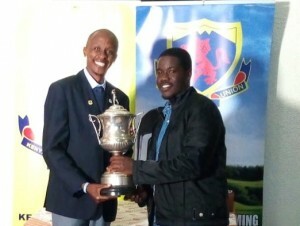 A. Weru, playing off handicap 26, won the Men winner prize. He returned a score of 40 (15+25) stableford points edging out handicap 20 Steve Mbinda and Ted Kwalanda, playing off handicap 24. Both had similar scores of 40 (20+20) stableford points. Mbinda was Men winner second, while Kwalanda was third. Handicap 25, Jane Gikonyo donned the Ladies gong with a score of 37 (18+19) stableford points, while Carren Agengo, playing off handicap 23, settled for Lady winner second with a score of 36 (17+19) stableford points. N. Kangethe was the First Nine winner with 21 points, while Collins Woro was the Second Nine winner with 24 points. In the commercials, eight two’s were recorded by E Kinyua, C Makau, J Wambugu, N Njuguna, S Kimani, M Karanja, F Gikonyo and N Bronwe, each receiving 13 golf balls for their feat. Joe Wambugu won Nearest to the Pin prize on hole 17 while Engineer Ndune and C Nganga were the Longest drive men and lady winners respectively.